Cloud computing has been interesting for businessmen in the E-commerce venture. The benefits of cloud computing for business brought this interest. It is a great advantage for small businesses to compete against large companies. These large companies already dominate the physical market. The capacity of cloud computing is to level the playing field. This brought the importance of cloud computing in business organizations. This importance reaches businesses in the same industry, regardless of size and brand. Quality products/services became the ultimate basis for conversion, leading to better revenue. Let us discuss the benefits of cloud computing for business later. Let’s discuss its basic definition first. Cloud computing is a network of servers. The Internet connects these servers. The front end, back end, and network consist the basic cloud computing infrastructure. What makes up the cloud? Computers we use to access information make up the front end of the cloud. So, when you are using the cloud services, you belong in the front end of cloud computing. The back end of the cloud computing infrastructure consists of servers. These servers refer to the physical servers in different parts of the globe. Internet connects them to provide the cloud services. Thus, Internet acts as the network that connects the front end and the back end of cloud computing. 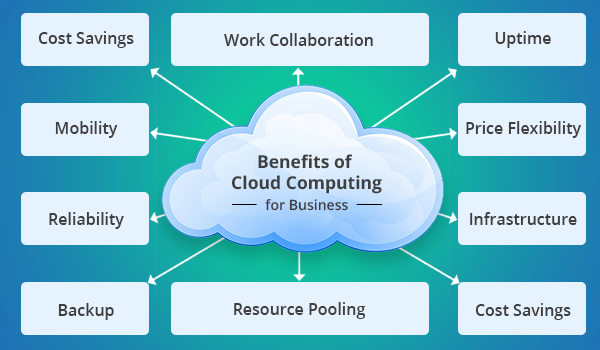 With this infrastructure, cloud computing provides the benefits of cloud computing for business. These gave the small businesses a fighting chance. They can now compete against large companies in the virtual market. Infrastructure – one of the notable benefits of cloud computing for business. Remote servers act as the infrastructure. The resource pool provides these servers. Clients don’t need to setup and manage their own physical infrastructure. That is already covered by cloud computing. Price Flexibility – one the benefits of cloud computing for business that attracts clients. Cloud computing can offer their price depending on the resources used. Many servers from the resource pool made this possible. The servers can accommodate websites regardless of their computing needs. Budget is a major concern for starting entrepreneurs. This is why they prefer a service that can stick to their budget. The good thing is that this is possible without compromising their business demands. A. Uptime – refers to the accessibility of your website from the user’s end. Cloud computing can guarantee a 99.99% uptime. This will keep your business open for the virtual market. The resource pool takes over one server in case it encounters hardware malfunction. Thus, your website will remain live and supported by a backup server. B.Backup – refers to the backup of data you upload into the cloud. Cloud computing provides the security of the data online. It also provides backup and updates them every now and then. In case of malicious attacks, this ensures that your business will be able to recover. Work Collaboration – people can work on the same data at the same time. This is possible despite distance because of cloud computing. Mobility – even outside the office, employees can accomplish work. This is possible as long as there is Internet connectivity. Also, any device can access these data. If you are not confident of your knowledge about the benefits of cloud computing for business and how to utilize it, don’t worry. This service can be provided by experts like other managed IT services. Choose the experts in the field to ensure that your business is in good hands.